Kuala Lumpur, July 31, 2013 – Biotechnology experts from around the world will gather at Malaysia’s premier and largest biotechnology event in the region this October to share ideas and new findings, announced Malaysian Biotechnology Corporation Sdn Bhd (BiotechCorp) today. BiotechCorp Chief Executive Officer, Dato’ Dr. Mohd. Nazlee Kamal said, “We are excited to bring this conference once again to highlight the industry’s growth. The event provides participant’s lots of opportunities to network, explore partnerships, and learn about the latest developments in the field of bio-based industry.” Elaborating on Bioeconomy, Dato’ Dr. Mohd. Nazlee pointed out that the global biotechnology market is expected to reach US$ 321 billion by 2015 with a compound annual growth (CAGR) rate of 7.42%. “What is interesting is that according to the Global Industry Analysis, 2012, the Biotechnology Market in Asia Pacific is fast outgrowing United States and Europe at 10.88% CAGR per annum. “This is good for the region, especially for Malaysia, as we are one of the most competitive biotechnology hubs in Asia-Pacific and we are also known for having a strong local biotechnology ecosystem that presents bountiful of opportunities for investors and biotechnology entrepreneurs alike,” said Dato’ Dr. Mohd. Nazlee. Another highlight at this year’s conference will be the inauguration of Bio-XCell, a 160-acre biotechnology park at Nusajaya in the Iskandar region of Johor, Malaysia. “Bio-XCell looks set to be among the world’s leading biotech location; focusing in building bio-economy together with the Asia Pacific’s market connecting to the international market. “Already several leaders in the biotechnology industry such as Agila and Biocon from India, Metex from France and Glycos Biotechnologies from the U.S.A. have confirmed to be anchor tenants,” he added. 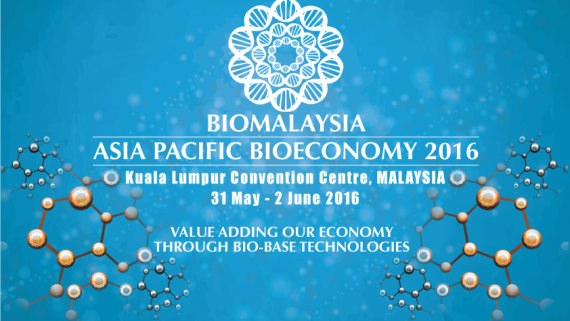 BioMalaysia and Bioeconomy Asia Pacific 2013 which will be held from 21 – 23 October 2013 is jointly organized by MOSTI, BiotechCorp, and Protemp Exhibitions Sdn Bhd. The annual conference and exhibition is expected to showcase presentations, new product launches, product demonstrations and business partnering sessions.